Cannabis Drinks: Coming to a Menu Near You? The slow but steady legalization of recreational marijuana throughout North America is continuing. Canada will officially legalize recreational use of the plant on October 17th, 2018 and many states are doing the same. What does this mean for the future of cocktails as we know them? Well, it sure looks as though cannabis drinks are creeping into the minds of businesses and consumers alike. 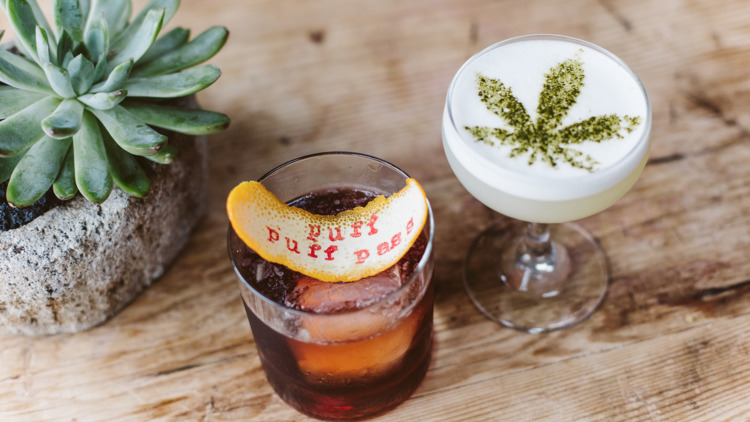 Restaurants such as Gracias Madre in West Hollywood, CA and Flore in San Francisco, CA, have introduced cannabis-infused cocktails to their menu. There are many others popping up as well. Typically, these establishments infuse alcoholic drinks with the oil of THC’s lesser-known cousin, CBD, or cannabidiol. THC, or tetrahydrocannabinol, is the component in cannabis that is more likely to give someone a feeling of “being high”, as it is psychoactive. CDB is more known for its ability to decrease feelings of anxiety. Also, it is illegal at this point to sell a combination of alcohol and THC. It’s not just at restaurants, either. Lagunitas, which is owned by Heineken, recently began selling their “Hi-Fi Hops” beverage, a sparkling water drink infused with THC. Molson Coors has agreed to partner with Hydropothecary Corporation (HEXO) based in Quebec, a leading pot producer, to work on developing a non-alcoholic, cannabis-infused beverage. With this purchase, HEXO will more than triple the size of their factory by the end of the year. Blue Moon creator Keith Villa left his company after 32 years to launch the startup Ceria. Ceria will be “dedicated to the creation of custom and cannabis-infused, non-alcoholic craft beer.” Diageo, which owns such brands as Guinness, Johnnie Walker, and Smirnoff, is meeting with Canadian companies as it considers dipping its toes into these same cannabis cocktail waters. The infusion of cannabis into drinks in place of alcohol may affect the wine and spirits industry as well. Rebel Coast Winery, located in Sonoma, California has been selling a THC-infused Sauvignon Blanc wine (non-alcoholic). It’s sold out on their site, so apparently it’s pretty popular. This niche market seems likely to have some serious growth potential. It will be interesting to see how it develops over the next few years, and what creations of cannabis drinks become crowd favorites. I would like to visit Gracias Madre in West Hollywood, CA and Flore in San Francisco, CA,which are restaurants that have introduced cannabis-infused cocktails to their popular menu. Great post!